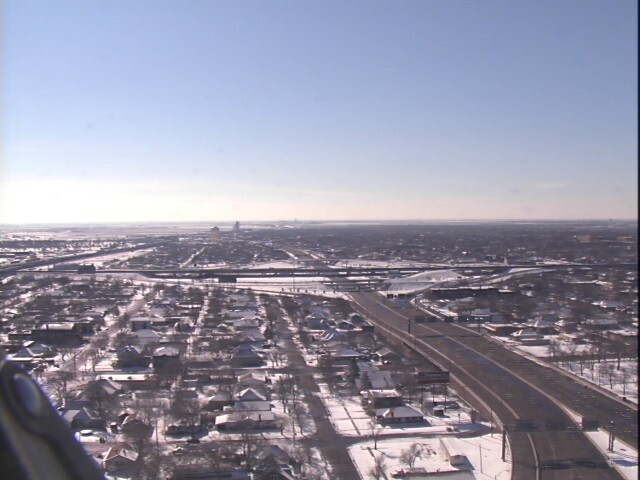 Morning sunshine showcases the high, rolling plains of the Texas Panhandle. 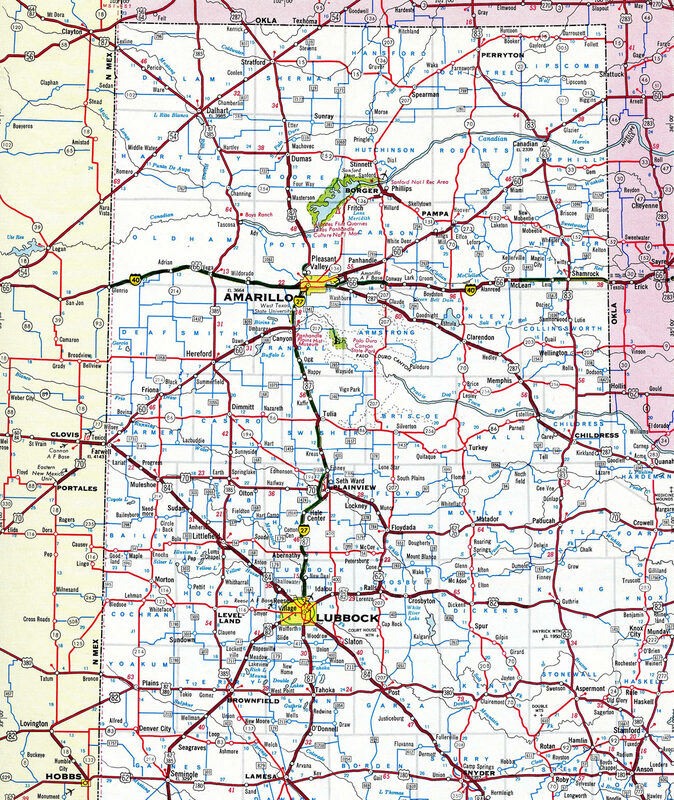 Connecting Amarillo with Lubbock, southbound Interstate 27 passes through farms and ranches on its way from Plainview to Hale Center. Photo taken by Robert Lee (06/21/06). Remaining within Texas for its entire length, Interstate 27 connects the cities of Lubbock and Amarillo in the panhandle. Bisecting Hub City between Texas Loop 289, a limited access beltway, IH 27 extends the U.S. 87 freeway north from Lubbock County to Downtown, where it curves eastward along side Mac Kenzie State Park. A volleyball interchange joins IH 27 with Loop 289 on the north side of the city as the freeway departs for Lubbuck International Airport (LBB) and the town of New Deal. Interstate 27 & U.S. 87 reach the city of Abernathy on the Hale County line. The freeway briefly transitions to an urban design, dipping below the Main Street overpass east of Downtown. Leaving town, IH 27 shifts one mile westward before bee lining northward to the city of Hale Center. There freeway again shifts to an urban setting, with a drop below Cleveland Avenue near the city center. The below grade sections of IH 27 at both Abernathy and Hale Center will close during periods of heavy rain. Beyond Hale Center, Interstate 27 & U.S. 87 angle northeast across agricultural areas to Furguson, where a Business Loop separates eastward to the city of Plainview. The interstate mainline circumvents the west side of the city to Columbia Street, where Business Loop IH 27 returns. Northward from there, IH 27 travels a rural route by Kress, Tulia and Happy, where U.S. 87 branches west to Canyon. U.S. 87 combines with U.S. 60 at Canyon onto an expressway leading north to Interstate 27. Construction of IH 27 directly overlaid the former four-lane route of U.S. 60 & 87 heading toward Amarillo. Within Amarillo, the freeway turns easterly ahead of the Potter County line before swinging back north to end at Interstate 40, opposite U.S. 287 and the dual couplets of U.S. 60 & 87 through Downtown. Interstate 27 is part of High Priority Corridor 38: Ports to Plains Corridor. The freeway follows U.S. 87 for its entire length, with U.S. 87 cosigned for a portion of the way. U.S. 60 overlaps with IH 27 as well from Canyon north to Amarillo, while U.S. 84 parallels it through Lubbock. Long standing rumors indicate that Interstate 27 may someday be extended from Lubbock south to Interstate 20 in the vicinity of Midland-Odessa, and possibly further south to San Angelo and ultimately to Interstate 10 and a border crossing with Mexico. A feasibility study was conducted in 2000 involving the Port-to-Plains High Priority Corridor 38, though upgrades were mostly done to U.S. 87 in place of building new stretches of freeway. Many portions of IH 27 were designated directly over previously four-laned sections of U.S. 87. Outside Lubbock, the last portion of Interstate 27 open to traffic was the easterly bypass of U.S. 87 between Happy and Canyon. 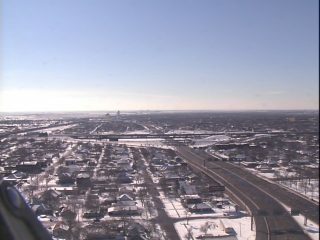 Looking southward from Downtown Amarillo at the interchange joining Interstates 27 and 40. The reconfiguration of this exchange elevated IH 40 above IH 27. The two previously met with IH 40 traveling at grade level. January 2001 webcam shot provided by John R. Detwiler. The turbine interchange where Interstates 27 and 40 meet south of Downtown Amarillo was reconfigured during a $33 million, three-year project completed in 2001. Interstate 27 directly replaced the alignments of U.S. 60 & 87 along Canyon Drive north and 36th Street east through south Amarillo. Turning north toward Interstate 40, the freeway briefly shifts away from the historic U.S. highways (36th and Fillmore Streets) between Harrison Street and the 26th Avenue off-ramp (Exit 123A). Photo taken by Robert Lee (06/17/06). The right lane defaults onto Exit 123B beyond the 26th Avenue on-ramp for Interstate 40 and U.S. 287 south. U.S. 287 north will merge onto U.S. 60 east & 87 north ahead of Downtown Amarillo. Photo taken by Robert Lee (06/17/06). A turbine style interchange facilitates movements between Interstates 27 and 40. All traffic bound for IH 40 and U.S. 287 south departs in unison here. Photo taken 05/05/12. Traffic separate onto single lane ramps for IH 40 west to Albuquerque, New Mexico and east to Oklahoma City, Oklahoma. Fort Worth references U.S. 287 leading southeast from Amarillo. Photo taken by Robert Lee (06/17/06). An end sign for IH 27 stands at the overpasses carrying the IH 40 mainline. U.S. 60-87-287 briefly overlap north from here to a dual one-way couplet through the central business district. Photo taken 05/05/12. Continuing north, the ending freeway splits into two surface streets: U.S. 87 north along Fillmore Street, and U.S. 60 east & U.S. 287 north along Buchanan Street. Photo taken by Robert Lee (06/17/06). A two-wye interchange partitions traffic for U.S. 60, U.S. 87 and U.S. 287 north through Downtown Amarillo. U.S. 60 turns east along side Business Loop I-40 in 1.7 miles. U.S. 87 and 287 remain paired northward for 48.5 miles to Dumas. Photo taken by Robert Lee (06/17/06). Button copy overheads for IH 40 and U.S. 287 referenced control cities from the IH 27 mainline. Advance signs now omit cities, while the new overheads at the Exit 123B split changed Tucumcari to Albuquerque. Photo taken by Jeff Royston (12/00). A series of traffic lights line Pierce Street south as motorists pass under the half mile sign for Interstates 27 and 40. Photo taken by Robert Lee (06/17/06). 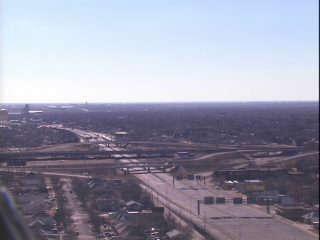 Leaving the center city of Amarillo, U.S. 60 west & 87 south elevate over the Fillmore Street off-ramp to combine with the Taylor Street (U.S. 287) on-ramp ahead of Interstates 27 and 40. Photo taken by Robert Lee (06/17/06). A weaving traffic pattern ensues at the merge point of U.S. 60 west & 87 south with U.S. 287 south. U.S. 287 briefly overlaps with the two US highways before joining Interstate 40 east toward Rick Husband Amarillo International Airport (AMA). Photo taken by Robert Lee (06/17/06). Taylor Street takes U.S. 287 southbound one block to the west of U.S. 87 (Fillmore Street) northbound through Downtown Amarillo. The first guide sign for IH 27 and IH 40 appears south of SE 9th Street. Photo taken by Robert Lee (06/17/06). Three blocks further south, U.S. 287 diverges from Taylor Street with three lanes curving southeast to the merge with U.S. 60 west & 87 (Pierce Street) south. Photo taken by Robert Lee (06/17/06). Traffic from U.S. 60-87-287 southbound combines with five lanes. Motorists must navigate to either the IH 27 southbound mainline or the departing ramps for IH 40 and U.S. 287 south over a two tenths of a mile span. Photo taken by Robert Lee (06/17/06). U.S. 60-87-287 span SE 15th Avenue on the lead to the three-lane departure for IH 40 east to Oklahoma City, Oklahoma and IH 40 west to Tucumcari and Albuquerque, New Mexico. Photo taken by Robert Lee (06/17/06). The left two lanes continue as U.S. 60 west & 87 south as well as nascent Interstate 27. U.S. 287 accompanies Interstate 40 east for 7.8 miles before branching southeast to Claude, Clarendon and ultimately Fort Worth. Photo taken 05/05/12. Looking at the first confirming marker for Interstate 27 from Canyon Drive southbound. The assembly is posted after the SE 26th Avenue on-ramp and three quarters of a mile south of Interstate 40. Photo taken 05/05/12. An auxiliary lane opens along Interstate 40 east from Washington Street to Exit 70 for Interstate 27 and U.S. 60-87-287. U.S. 60 angles northeast from Hereford to combine with U.S. 87 and IH 27 north from Canyon. Beyond the overlap with U.S. 87-287 through Downtown Amarillo, U.S. 60 ventures northeast to Panhandle, Pampa and Canadian. Photo taken by Robert Lee (06/17/06). Exit 70 parts ways with IH 40 east at the Tyler Street underpass. 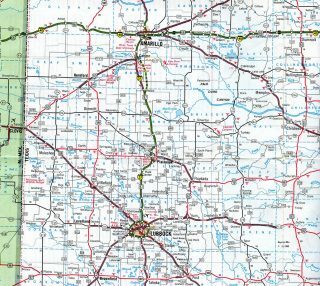 IH 27 south reaches the Lubbuck city limits in 115 miles. U.S. 87 and 287 north overlap from Amarillo to Dumas. U.S. 87 angles northwest to Clayton, New Mexico, then turns north to follow the Interstate 25 corridor, while U.S. 287 follows the Ports to Plains Corridor north to Interstate 70 near Limon. Photo taken by Robert Lee (06/17/06). A direct ramp joins U.S. 60-87-287 north to Buchanan and Fillmore Streets through Downtown Amarillo. The southbound on-ramp utilizes Breezewood connection along the west side frontage road of IH 27 to East 28th Avenue. Photo taken by Robert Lee (06/17/06). IH 40 west & U.S. 287 north span a BNSF Railroad yard ahead of their split at Exit 70 for IH 27 south. Photo taken by Robert Lee (06/17/06). Interstate 40 continues west toward Tucumcari and Albuquerque in New Mexico as Exit 70 departs for Interstate 27 & U.S. 60-87 south to Canyon and Lubbock and U.S. 60-87-287 north through Downtown Amarillo. Photo taken by Robert Lee (06/17/06). Single lane ramps take motorists onto IH 27-U.S. 87 south & U.S. 60 west and U.S. 60-87-287 north to their dual couplet separation along Buchanan and Fillmore Streets. Photo taken 05/05/12. Interstate 27 and U.S. 87 follow a below grade, six-lane freeway corridor south of Downtown Lubbock. Decommissioned by 2012, U.S. 87 Business, which paralleled the freeway along Avenue A to the east, merged onto IH 27 & U.S. 87 after Exit 1C for 50th Street (FM 835 east). Photo taken by Robert Lee (06/17/06). Southbound Interstate 27 & U.S. 87 reaches the slip ramp (Exit 1B) for the west side frontage road. The frontage road south connects with the volleyball interchange at U.S. 84 (Avenue Q) and Avenue A (old U.S. 87 Business) north. Photo taken by Robert Lee (06/17/06). Exit 1A links IH 27 south directly with Loop 289 west. Loop 289 east is accessed via either the IH 27 frontage road south or by following U.S. 84 east to MLK Boulevard. Photo taken by Robert Lee (06/17/06). Passing under the Loop 289 mainline and frontage road system, drivers on IH 27 & U.S. 87 split with the two-lane ramp (Exit 1A) for Loop 289 west. U.S. 87 extends south as a full freeway another 4.6 miles to 146th Street. Photo taken by Robert Lee (06/17/06). Interstate 27 extends a short distance beyond Loop 289 to the diamond interchange (Exit 1) with 82nd Street. 82nd Street runs along the south Lubbock city line from Avenue P east to U.S. 84. Photo taken by Robert Lee (06/17/06). Interstate 27 ends at the off-ramp (Exit 1) for 82nd Street. U.S. 87 continues south 25.4 miles to U.S. 380 in Tahoka. Photo taken by Robert Lee (06/17/06). The first advance signage for Loop 289 precedes the unnumbered diamond interchange joining the U.S. 87 freeway with 98th Street. Photo taken by Robert Lee (06/17/06). U.S. 87 passes over 98th Street on the one mile approach Exit 1 with 82nd Street. IH 27 begins on the north side of the diamond interchange with 82nd Street. Photo taken by Robert Lee (06/17/06). All movements from U.S. 87 north to Loop 289 and U.S. 84 (Avenue Q) are made via the east side frontage road of IH 27 north from 82nd Street (Exit 1). U.S. 84 leads northwest from Lubbock to Littlefield and southeast to Slaton. Photo taken by Robert Lee (06/17/06). The IH 27 frontage road system north to Avenue Q was formerly a part of U.S. 87 Business. The bannered route was eliminated by 2012. Photo taken by Robert Lee (06/17/06). U.S. 87 upgrades to IH 27 as Exit 1 departs for 82nd Street, SL 289, U.S. 84 and Avenue A. SL 289 encircles Lubbock as a 26.09 mile freeway. Photo taken by Robert Lee (06/17/06). The zero milepost for IH 27 stands just north of the 82nd Street on-ramp. IH 27 and U.S. 87 remain cosigned through Lubbock. 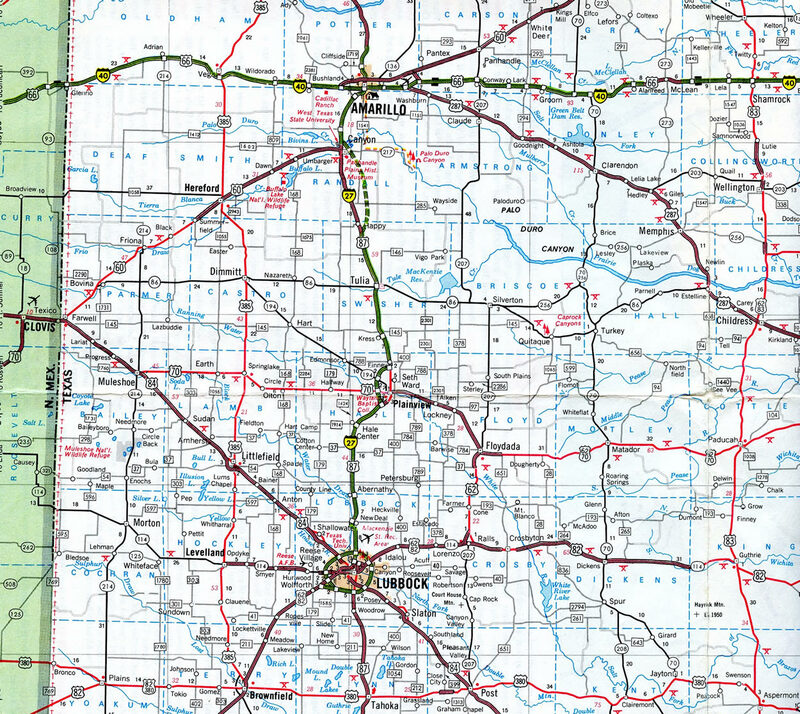 They generally parallel each other all the way to Amarillo, with separations between Exits 63 and 77 and again between Exits 88 and 110. Photo taken by Robert Lee (06/17/06). Loop 289 heads west from U.S. 84 (Slaton Highway) through an industrial area ahead of IH 27 north and U.S. 87. Photo taken by Robert Lee (06/17/06). A two-lane ramp shifts traffic onto the adjacent frontage road system for both IH 27 & U.S. 87 north to Downtown Lubbuck and the U.S. 87 freeway south toward Tahoka. Photo taken by Robert Lee (06/17/06). The frontage road provides a collector distributor setup through the full cloverleaf interchange with Interstate 27 and U.S. 87. Photo taken by Robert Lee (06/17/06). A loop ramp takes motorists onto the ending Interstate 27 south and U.S. 87 for Tahoka. 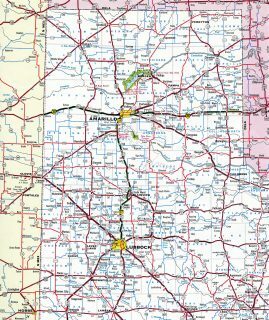 U.S. 87 travels south from Lubbock to Lamesa, Big Spring (I-20), Sterling City, San Angelo, Eden, Brasy, Mason, Fredricksburg, Comfort (I-10) and San Antonio. Photo taken by Robert Lee (06/17/06). A quarter mile separates the University Avenue on-ramp from the slip ramp onto the south side frontage road joining Loop 289 east with U.S. 87 south. Photo taken by Robert Lee (06/17/06). A Breezewood type connection requires motorists to travel by a number of businesses along the SL 289 frontage road to the off-ramp for U.S. 87 south to Tahoka. Photo taken by Robert Lee (06/17/06). A high speed flyover joins Loop 289 eastbound with IH 27 & U.S. 87 north directly. Interstate 27 and U.S. 87 head north from Lubbock to Plainview, Tulia, Canyon and Amarillo. Photo taken by Robert Lee (06/17/06). The SL 289 frontage road sees a loop ramp for IH 27 & U.S. 87 north, providing local access to the freeway to Downtown from Avenues S, Q and P. Photo taken by Robert Lee (06/17/06). “From Anywhere to Everywhere: The Development of the Interstate Highway System in Texas.” http://tti.tamu.edu/interstate_anniversary/white_paper/ by Penny Beaumont, Rhonda Brinkmann, David Ellis, Chris Pourteau, and Brandon V. Webb, Texas Transportation Institute, page 29. “San Angelo Leaders Approve TxDOT I-27 Interstate Feasibility Study.” SanAngeloLive.com. July 31, 2015. Page updated April 6, 2017.